Up Day / Moving Up Day / Transition Day - whatever you call it is an exciting/nervous time for students moving up a year level. I Can't Wait for Next Year is a perfect activity to use to capture their feelings towards this move and build excitement about the next year. 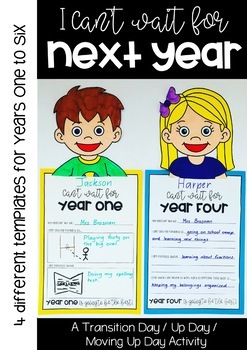 Featuring four different templates for years one-six, this download caters for the many abilities within a classroom. Simply print, have students complete by colouring and answering questions and then cut and mount on coloured paper or card. **This resource is intended for ONE teacher ONLY. Please do not share (digital and print versions) with colleagues. If a colleague wishes to use this resource please respect the copyright of my products and direct them to my TPT store. Multiple licences must be purchased if you wish to use this resource with other teachers. Follow my Facebook page for giveaways and updates! Thankyou for visiting A Teacher Among the Gum Trees, before you leave make sure you follow my TPT store to keep up to date with new releases, discounts, freebies and updates! Don’t forget to provide feedback on this product to earn TpT credits that you can use to lower the cost of future purchases!